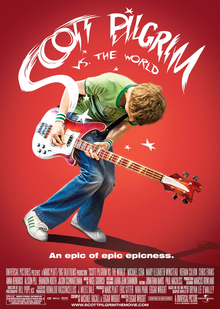 It's just about a month away now - the theatrical release of the first Scott Pilgrim movie. I'm excited to see how they do it. The books are so crazy and fun and Michael Cera is such a fun and quirky actor. I can totally see him as Scott Pilgrim. We've stocked up on the graphic novels again at Neptune. 1-5 is available for those you you who have not yet enjoyed the spunky fun of S.P. Volume 6 is coming Jully 20, so that will give you some time to get caught up with the first 5 installments and then pick up 6. This is fun for those who like manga - it has that general feel to it. Also young adults and people who are looking for something different from the comic book super heroes. Make your own Scott Pilgrim avatar. It's fun! Apenas uma inscrição e os seus links entrarão todos de forma automática. Novos inscritos todos os dias.